To celebrate the fifth edition of its Baume & Mercier & Me charity campaign, the Geneva-based watch brand is associating with actor Andy Garcia as the new star ambassador of its now famous humanitarian initiative. The philanthropic mechanism of this campaign is both simple and effective: Andy Garcia, like the Hollywood celebrities in the previous campaigns, is offering voluntary use of his reputation and his image by serving as a Baume & Mercier ambassador for a full year – in exchange for the brand providing financial support to the charities of his choice. All royalties normally due to Andy Garcia, as well as those of photographer Greg Gorman, will be donated to several organizations working in the fields of cancer research, child education, helping underprivileged women and the struggle against poverty – all causes that Baume & Mercier has been actively supporting for some time now. The Baume & Mercier & Me charity campaign first launched in 2005 was one of the first of its kind. But the brand’s commitment to others goes much further back. Arthur Baume, son of one of the founders of the Maison Baume and director of the Baume & Co subsidiary company in London, personally undertook to help the city’s French hospital during World War I. He served as Chairman of the establishment, thereby taking over from his uncle and predecessor Celestin Baume in the 19th century. In 1920, Arthur Baume was rewarded for his devotion by the French President Raymond Poincaré, who presented him with the Legion of Honour. During World War II, the Chairman of Baume & Mercier, Constantin de Gorski, was also actively involved in the activities of the Red Cross in Geneva. Since the 1920s, the brand has consistently striven to defend noble causes relating to the environment, children and medical research, and Baume & Mercier now continues to cultivate this philanthropic legacy in an innovative way through its Baume & Mercier & Me campaign. This campaign enables Baume & Mercier to convey, in an authentically committed manner, the three values forming the essence of its brand identity: proximity, authenticity and creativity. Proximity through the association with famous personalities well-known to the general public, who nonetheless remain accessible and are prepared to engage in helping others. In the same way, within the world of luxury watchmaking, Baume & Mercier has managed to remain an accessible brand producing watches that become intimate possessions for their owners. Therein lies the true meaning of the slogan Baume & Mercier & Me. These close ties are visually illustrated by the close-up shots of Evangeline Lilly and David Duchovny, who reveal themselves without artifice, as they are in daily life, in order to serve good causes that touch them profoundly. Authenticity through an approach based on heart-felt values: the personalities who take part in the Baume & Mercier & Me campaign do so pro bono, in order to serve noble causes they share with the brand. This authenticity echoes that which undergirds Baume & Mercier’s entire approach to watchmaking, building on 179 years of uninterrupted history and expertise to craft genuine Swiss watches. Mercier watches have been famous over the decades, while remaining deeply rooted in the timeless values of Swiss watchmaking. The previous Baume & Mercier & Me campaigns were created in cooperation with Meg Ryan and Kiefer Sutherland (2006), Kim Basinger and Gary Sinise (2007), Teri Hatcher and Ashton Kutcher (2008). 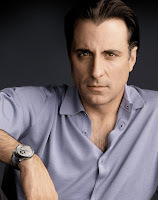 For this campaign, Andy Garcia wears a Baume & Mercier Classima Executives XL MOAO 8688 steel watch. This classic, timelessly elegant watch with its guilloché dial featuring an opening that reveals the balance, is a perfect match with his personality. With its Roman numerals, straight-line guilloché dial and blued hands, it features the best of traditional watchmaking interpreted in a contemporary manner ideally suited to all circumstances. The ideal watch for classic yet relaxed personalities such as Andy Garcia.